hi, i am running tenfourfox 45.8.0...it's great but i want to use flash player for the BBC iPlayer. 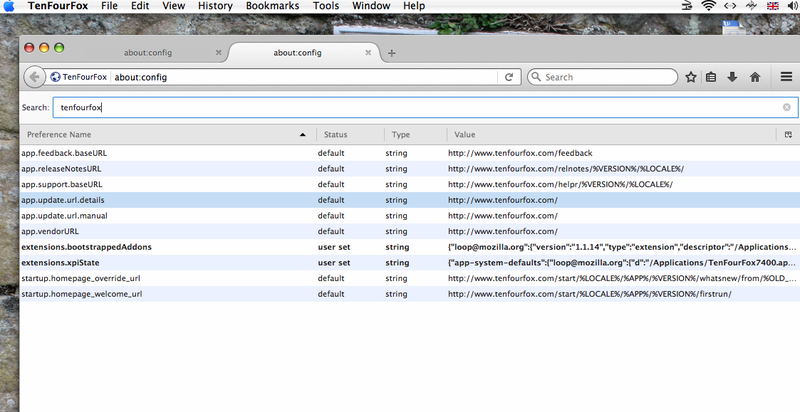 if i type about:config and then tenfourfox nothing shows up, so how can i enable Flash ? If you're looking for tenfourfox.plugins.enabled, the last version of TenFourFox to support that was 17.0.11. Because of changes in Mozilla's plugin architecture, there is no way to reenable old PowerPC-compatible plugins in TenFourFox 19 and later, so this is no longer possible. You might have some luck with SandboxSafari but you're on your own with that. Ok, so does this mean flash cannot be enabled? So, I cannot watch videos on FaceBook? The code to support the PowerPC-compatible Flash plugin no longer exists. Mozilla removed it and restoring it is non-trivial. If you need to use Flash and SandboxSafari (linked above) doesn't work for you, you must use another browser. Tony, please read the comments by Cameron Kaiser (above). You can try Safari or TenFourFox 17, but the PPC plugins available (Flash 10.2 and Silverlight 1 (?)) will likely be too old for Netflix/Hulu anyway nowadays. These plugins will never be updated again for PPC by Adobe and Microsoft. If you depend on Netflix, a PPC Mac isn't the right option for you. Are you talking to the right person? I am Gary, not Tony.